In our Level 5 class, you will go through the process to create your own show, blending the skills you’ve learned in previous levels to create your own unique group style. Plus, you’ll receive more personalized feedback and ways to improve those skills. Level 5 is as much technical as creative, looking at the performer’s relationship with the audience and the practicalities of putting on a long-form performance as a team. This class has a minimum requirement of 12 students and a maximum of 16 students. This is the advanced ‘Harold’ course which will define for your team the type of Harold you want to perform and how you run a show. Level 5 is as much technical as creative, looking at the performer’s relationship with the audience, and the practicalities of putting on a long-form performance as a team. This includes a class trip to the ICC Theatre (free show). You will hone physical performance skills with the audience perspective in mind, work on stage pictures, tempo adjustment, mirroring scenes, different types of edits. Many techniques that can make your show as interesting as possible. Each week we will introduce you to new exercises and challenges to help you become more aware, a better listener, and more confident in a safe and supportive atmosphere. You will also continue supporting the ensemble and build on each other’s ideas. Anyone 18 years old and over who has completed our Levels 1-4 or with special approval from the Artistic Director. 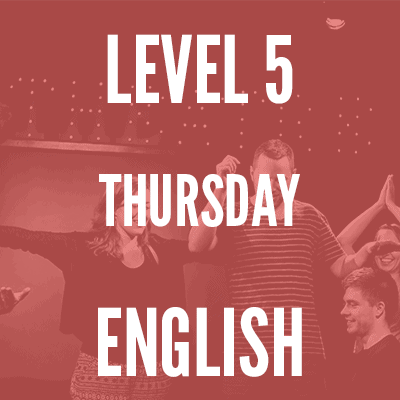 Level 5 is a 6-week course with each session lasting 3 hours. All you need to bring with you is comfortable clothing, a notepad and pen and an open mind. There will be a performance at the end of the course during our nICCe Sunday community show. Level 5 is the culmination of your initial training at ICC and will give you and your team the confidence to perform in front of an audience of strangers. As a team, you will have a bond that few other activities can offer. You will feel invincible. It’s showtime! Jay is the current Artistic Director and Head of Training at ICC Theatre and has taught and performed improv professionally for over 27 years all over the world. He was a faculty member of The Second City Chicago, The Second City Hollywood, iO Chicago (where he was also head of their artistic committee), ComedySportz Chicago, M.i.’s Westside Comedy Theater and Today Improv. He performed for over 2 years at Second City NW, was on several house teams at iO Chicago, Westside Comedy Theater, and an ensemble member of ComedySportz Chicago. Additionally, he has performed at festivals throughout the world, including the Chicago Improv Festival, Copenhagen International Improv Festival, BIG IF4, Edinburgh Festival Fringe, and the Del Close Marathon.